1. From the Email Statements page, you can select all records with Contributions or select a specific Public List of records to email contribution statements. NOTE: You must have the Agent | Contribution Statement Email configured prior to sending email statements. 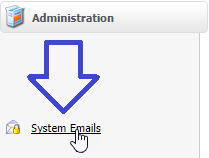 From the Administration menu, select the System Emails option to ensure this is configured. 2. 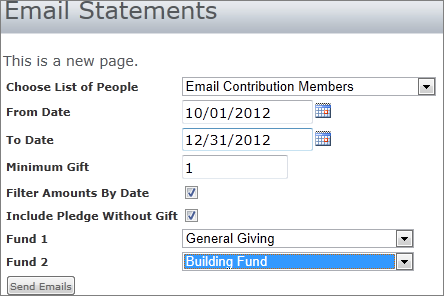 Create a list of records to send statements or skip this step if you elect to email all contributors. 3. Enter or select the From Date. 4. Enter or select the To Date. 5. Enter the Minimum Gift amount. 6. If desired, select the Filter Amounts By Date check box. If you select this option, Arena filters by the previously entered date range. 10. Enter Minimum Gift amount. 11. If desired, select the Filter Amounts By Date check box. 12. If desired, select the Include Pledge Without Gift check box to include those that pledged but did not give. 14. Click the Send Emails button. Arena sends all statements.